FILE - Motorcycles ride past buildings destroyed during the fighting in the northern town of Ariha, in Idlib province, Syria, Sept. 20, 2018. The United States will pursue "a strategy of isolation," including sanctions, with its allies if President Bashar al-Assad holds up a political process aimed at ending Syria's seven-year war, a top U.S. diplomat for Syria told Reuters on Friday. Jim Jeffrey, the U.S. special representative for Syria, said Washington would work with countries in Europe, Asia and the Middle East to impose tough international sanctions if Assad's government failed to cooperate on rewriting the Syrian constitution as a prelude to elections. "If the regime does that, we believe that then we can go after it the way we went after Iran before 2015 — with really tough international sanctions," Jeffrey said, referring to secondary sanctions against Tehran for its nuclear program. He added: "Even if the U.N. Security Council won't pass them we will just do it through the European Union, we will do it through our Asian allies, and then we will make it our business to make life as miserable as possible for that flopping cadaver of a regime and let the Russians and Iranians, who made this mess, get out of it." 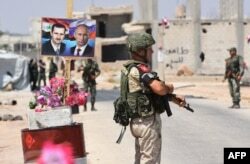 FILE - Members of Russian and Syrian forces stand guard near posters of Syrian President Bashar al-Assad and his Russian counterpart Vladimir Putin at the Abu Duhur crossing on the eastern edge of Idlib province, Aug. 20, 2018. Assad's allies Russia and Iran, as well as China, have made some investments in the country, but they cannot afford the cost of rebuilding and want other countries to share the burden. Jeffrey has been charged by U.S. Secretary of State Mike Pompeo to oversee Washington's role in a political process as a U.S.-led coalition cleans up the last remaining Islamic State militants. A recent agreement between Turkey and Russia that averted a Syrian army offensive in Idlib, the last major area under rebel control, and the accidental downing of a Russian war plane by Syrian forces was an opportunity to push for the implementation of U.N. Security Council resolution 2254 that covers ending conflict in Syria, Jeffrey said. 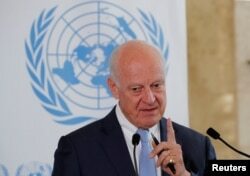 The U.N. Security Council, which includes Russia and the United States, mandated U.N. envoy Staffan de Mistura to get a deal on a new constitution, new elections and a reform of Syria's governance. Formation of a constitutional committee was agreed at a Syrian peace conference in the Russian ski resort of Sochi in January. It is up to de Mistura to decide whom to pick and he has said he will select about 50 people, including supporters of the government, the opposition and independents to participate. FILE - U.N. Syria envoy Staffan de Mistura attends a news conference at the United Nations in Geneva, Switzerland, Sept. 4, 2018. The Syrian government at first agreed to the plan, but later rejected it. Its submission of a list of names to the United Nations follows a meeting this month between Assad and his main backer, Russia's President Vladimir Putin. Russia has held the balance of power in Syria, both on the battlefield and in the U.N.-led peace talks, for the past two years. It has helped Assad recover huge amounts of lost territory in Syria without persuading him to agree to any political reforms. But nine rounds of talks, most of them in Geneva, have failed to bring the warring sides together to end the conflict that has killed hundreds of thousands of people and driven millions from their homes. Meeting on the sidelines of the annual U.N. General Assembly on Thursday, foreign ministers from the United States, Egypt, France, Germany, Jordan, Britain and Saudi Arabia called on de Mistura to convene the constitutional committee and report back on progress by the end of October. Jeffrey said Moscow was still in discussions with Russia to use its influence to persuade Damascus to negotiate and allow officials to travel to Geneva for the talks. "Our feeling is that if he can't we cannot let the Russians hold this thing hostage forever," he said. While an offensive on Idlib was averted, Washington still worries that the Syrian government could use chemical weapons. President Donald Trump has twice authorized U.S. airstrikes against Syrian government targets as punishment for alleged chemical weapons use. "It is not off the table because the regime is stuck with only half the territory and population of Syria under its control, and the lowest hanging fruit is Idlib because the other areas you deal with the U.S. directly and Turkey directly," said Jeffrey.